While BJP is trying to polarise the issue, the Congress is also not ready to risk “Hindu votes” and not making their stand clear on this systemic discrimination against women. 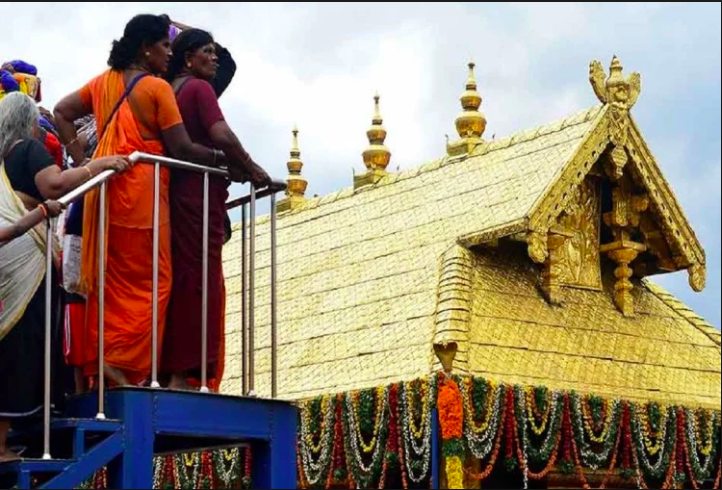 The Ayyappa temple in Sabarimala, a Hindu pilgrimage centre in the western ghats of Pathanamthitta District of Kerala, till September 28, 2018, banned the entry of women in the menstrual age. Ayyappa, the legend has, is a celibate deity and thus, the ban to protect the celibacy of the deity. The Supreme Court of India on September 28, revoked this ban recognising it as a form of gender discrimination. While the women rights activists across the country were jubilant about the verdict, many in the state of Kerala and elsewhere objected to the judgment. The judgement which bans the discriminatory practice and irrational belief is being protested with the argument that it hurts the religious sentiments of Hindus. On one hand, there are arguments put forward by the devotees which do not recognise this custom as discriminatory and on the other hand, the Hindu Right wing party, Bharatiya Janata Party and other Hindutva organisations, have jumped at the opportunity to set a stage for what they are well known for- “politics of sentiment.” The Congress is also set to reap the benefits of this politics. Kerala is one of the 11 states in the country where the BJP has not been able to mark its presence. The state is also under the Communist Party of India (Marxist)-led Left Democratic Front (LDF) government, which is not only a political other for the BJP but also an ideological enemy. The BJP and the Sangh Parivar has no claims to make in the state and garner votes. As they do in such circumstances especially, the Sabarimala verdict is being used to polarise and communalise the state by provoking sentiments. However the Left government in the state has been standing firm on its commitment to the verdict. People who are not welcoming the SC verdict are arguing that it does not do justice to the sentiments of devotees, who according to them are the vanguards of the mission for protecting the celibacy of Ayyappa. These sentiments are nothing more than the discriminatory practices and the reactions following are a testimony of the deeply ingrained patriarchy in society. This was proven on October 12, 2018, when Malayalam actor, Kollam Thulasi threatened to cut women in half if they visit Sabarimala. He was speaking at an event in Kollam where he shared the stage with BJP state president P. S. Sreedharan Pillai. Thulasi, who is a BJP member and was the party’s candidate from Kundra in Kollam during the 2016 assembly elections, issued the threat at a ‘Save Sabarimala’ campaign organised by constituents of the BJP-led NDA, such as Bharath Dharma Jana Sena, to protest against the SC verdict. Ayyappa does not figure amidst millions of Hindu gods and goddess mentioned in the Puranic texts. The celibate lord who is believed to be Hari Hara Suta (son of Vishnu and Shiva) is worshipped only in southern India. The devotees mostly hail from Kerala, Tamil Nadu and some parts of Karnataka and Andhra. There are many temples of the deity across these states and ironically, none of them restrict the entry of women; similarly while devotees can visit these temples (other than Sabarimala) with no restrictions any day they want to, they have to observe a 41-day of sexual abstinence before undertaking the pilgrimage to Sabarimala. These ironies pushes us to ask, why such restrictions and rules only in the temple in Sabarimala? This was also the question that was echoed by the petitions filed in the apex court by the Indian Young Lawyers’ Association, Happy to Bleed and other petitioners challenging the ban. Chief Justice of India, Deepak Mishra had raised this question during the hearing in July. He had said, “This is imposition of an impossible condition that one has to observe a 41-day abstinence... You are imposing it. You put 41 days so that a woman can’t go. What you cannot do in law is being done by imposing this condition. You are doing it indirectly.” The temple allowed only pre-pubescent girls and women who have hit menopause to enter the premises. As rightly reasoned out by Misra, the rule of 41 days of abstinence, compulsory prayers and rituals naturally forbids the menstruating women from entering the temple. This debate of the temple entry of women in Sabarimala is not a new one. State governments so far, courts, the Pandalam royal family, priestly class, Hindutva organisations and the devotees have held different standpoints on the issue. Now, when the apex court has revoked the ban, many who were in favour of the ban are arguing that the chief deity in the temple is a celibate. So, allowing women to worship in the shrine is a sin. Do we have any goddess who is celibate and men are not allowed to visit the temple because the goddess is celibate? (Yes, there are temples in Kerala where men are not allowed during specific rituals, nevertheless the priest are always men irrespective of the gender of the deity) Menstruation is considered to be impure and hence, menstruating women are impure. How Old is the Ban? The ban on women entry in the Sabarimala temple has been in force only since 1991. The ban was enforced under the Rule 3(b) of the Kerala Hindu Places of Public Worship Rules 1965 which dictates that in religious areas where women are not allowed to enter “by custom”, this custom shall be maintained. It is to be noted that this prohibition is not against all women, but only those who fall within the menstruating age. The five judge bench of Supreme Court in its 4:1 majority verdict said that this provision violates the right of Hindu women to practice religion. It also said that patriarchy in religion cannot be allowed to trump the right to pray. Along with the taboo of menstruation, it is important to note that the belief that women are “Maya”, a distraction is a widespread belief. The ban on the entry of women into the temple because the deity is celibate is just a reiteration of this belief and taboo. These beliefs have been used as tools by the Hindu patriarchal society to subjugate women and the SC rightly recognised the traces of this in the practise of the temple. Religion has been a very strong tool of patriarchy to oppress women. Women are made to believe that even gods who are supposed to be beyond human existence and divinity would be distracted by their presence; and because of menstruation, their bodies are not pure enough to be close to the divine. The arguments put forward by the spokespersons of the Devaswom board ever since the SC has revoked the ban acts as a testimony to this gender prejudice. In one of the panel discussions with NDTV, lawyer Sai Deepak, who represented the deity in the court, is seen arguing against the verdict by differentiating between god and deity, exclusion and discrimination. His argument is that Ayyappa is a deity and not god, and the ban is “just an” exclusion and not discrimination is also echoed by the hundreds of the protesters against the verdict.